I have another blog, called Twisted Running, seperate from this one for those who prefer not to be bored to death with terms like fartleks, ITB Syndrome, and negative splits. The twisted part refers to my scoliosis, which two chiropractors have told me is the worst they've ever seen. Yeah, so. But still, I run. And this is my running story. It starts a long time ago, long before I was running. Long before I was walking. Or weight training, or anything. My story starts when I didn’t move at all. No weight problem yet. Just proof that I was a 70s kid. Not sure I could pull off those pigtails now. I grew up as a pretty classic 80’s kid: not moving much; eating a lot. I remember my Dad riding his bike a lot, but I didn’t go with him much. And I remember walking with my mom… to Baskin-Robbins. In my view we were an academic family, not an athletic one, and that role suited me just fine. My weight problem did not suit me just fine, but since I wasn’t athletic, what could I do about it? And so I struggled internally, but did nothing to solve the problem. In 2001 my husband and I married, and I started to observe two things: that many people in our families were heavy, and that a lot of newlywed couples gained weight. I didn’t want that for us. I made some small but meaningful changes in the way I cooked for my husband and me, and we started hiking on the weekends (and working out during the week to train for our weekend adventures). The first year we were married, I lost 40 pounds and my husband lost 70. He still jokes that between us that first year, we lost the equivalent of a Backstreet Boy. 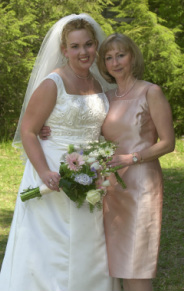 Me on my wedding day, shortly before I decided the weight madness had to end. My mom shown for scale (actually, she’s tiny by anyone’s standards). I actually completed a 5k the year after we got married, but…running was hard. I wanted to do it, but just didn’t see myself as ‘a runner.’ So I didn’t run anymore. My eyes narrowed. My brow furrowed. And I was all, "CHALLENGE ACCEPTED." So I looked at the calendar, started training, and two months later, in January 2008, I finished my first present-day 5k. I wanted to run the whole thing, but I couldn’t. I trained intermittently after that, running another 5k that year, but didn’t really love it. I loved that I lost weight and felt good, but it was still hard. I ran just enough to be able to complete the 5k and then, the Peachtree Road Race in 2009. Me after my 2008 5k. It took another 3.5 years for me to decide I was a runner. 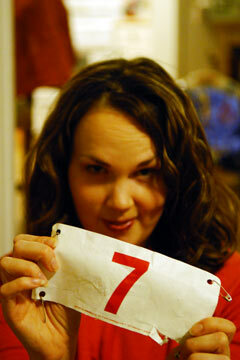 Then, in late 2009, my friend Kristiana said “Hey, I think I’m going to run a half-marathon. Want to join me?” I gave her a definite “NO.” I had said many times that I felt no need to EVER run for more than 35 minutes at a time. But she was determined to do it, and I am her friend, so I reluctantly signed up for the 2010 Country Music ½ Marathon. I had no training plan, no real running shoes, no fancy GPS watch. What I did have was a lot of fear. But that was all about to change. It was around the time that I started spending Saturday mornings running eight miles or more that my LOVE for running developed. Once I started setting aside major chunks of time to complete my long runs, and didn’t feel pressure to be back at home/running errands/socializing, I could settle in to the activity and just enjoy it. I also felt so accomplished when I was done. I shed 32 pounds off my 5’6” frame, which certainly didn’t hurt my feelings any. And oh, let us not forget the endorphins. THE ENDORPHINS. I was slow, and I was (and still am) untalented, but I fell hard for running. It’s a long-term relationship. After my 2nd Marathon, February 2013. After running two marathons, ten half-marathons, five Ragnar relays, and even the epic Hood to Coast, this sport has my heart now more than ever. It changed my life, as it has changed so many others. I know the feelings of challenge, and accomplishment, and hard work. I know defeat, and I know perseverance. I know how a run can make you feel more alive than you’ve ever felt before, and how it can make you feel like you might just need to lay down on the ground and die. I love it, all, and I hope I can help you love it, too.